Cast: Jim Carrey, Steve Carell, Will Arnett, Seth Rogen, Dan Fogler, Isla Fisher, Jonah Hill, Amy Poehler, Jaime Pressly, Carol Burnett, Charles Osgood. Directed by Jimmy Hayward and Steve Martino, adapted from the books by Dr Seuss. Story: Elephant talks to microscopic creatures. That's a really difficult title to remember. Horton Who's Hearing a Hoover ... er ... Hairy Whores in Hoses ... it makes more sense when you see it. Dr Seuss adapations have had something of a rocky ride in the past, with both The Cat in the Hat and The Grinch dividing opinion. 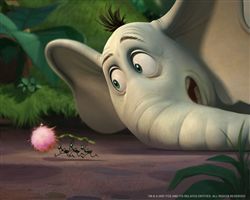 Horton Hears a Who sticks more closely to the source material and is entertaining and funny to boot. Although primarily aimed at kids, the script has seriously profound implications, drawing clear parallels to religion without picking out any one doctrine for specific analysis. Big friendly elephant Horton with his big flappy ears is able to hear one of the microscopic villagers on a speck perched on a flower, but that's the only villager that can hear him talking back. Neither can see the other, so each has to persuade their respective races that the other exists, without any kind of evidence to back it up. See what I mean about religious parallels? The specky village is called Whoville and each little chap within is a "Who" - so now the title makes sense too! Horton Hears a Who is fun for all the family. The kids will be entranced while the adults can ponder the metaphysical connotations if they like - or lap up the good clean fun with the rest of us. To enjoy this film you should: take a kid along so you have an excuse to see it. Horton Hears a Who was released in the UK on 21st March 2008.